Three days of sheer holiday. Lots of free time and lots of sleep – The best highlights of any holiday. But then there is always more to than just that. After a long long wait, we finally visited this much talked about shopping mall in the suburbs of Mumbai. And must I say, I am impressed. 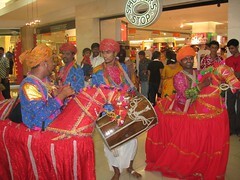 In Mumbai this would be one of the best malls rated to match International Standards. Wide alleys, strategically located shops, large dust-bins and a clean shopping environment is what this place has to offer. One of the key advantage is the availability of goods at every price range possible. You have the Weekender, Shoppers Stop and even the Suneet Vermas & Ritu Beris. I could go on but better still drop in there. And yes while we were there, we witnessed a supposedly Diwali holiday special program where the folk men performed some traditional dances. 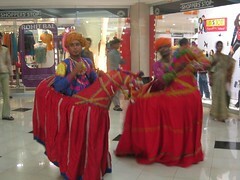 Didn’t get to see the full show but captured a few snapshots when they cruised along the mall floors. Yes, I picked up this book and I am going to give it a good read. Have been seeing a lot of reviews and suggestions for this one. So it’s here finally. Meanwhile I updated my book reviews at Allconsuming.Net. Diwali means good food, lots of mithai and bad stomachs at the end of it all. So Thursday night I decided to end the long holiday with a nice cold salad before dinner. Saw u on my comment box at the cook book. thx for dropping by. been to ur cook blog, U have a nice thing running here too. Had the same stuff at Juhu Shoopers Stop. Hope you had a cool Diwali.